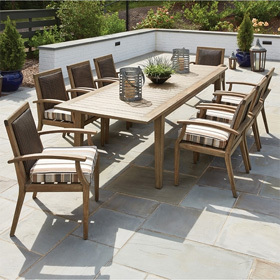 Manufacturers OW Lee and Woodard offer outdoor dining table bases which can be combined with their outdoor dining table tops to create unique patio centerpieces. As the selection of table bases continues to grow, it's now possible to find a base with your ideal shape (circle, oval, rectangle or square) and size (small, medium or large). You can also search by materials such as aluminum, wrought iron and wicker, and even choose a custom finish color to match your patio design.